Milíč of Kroměříž was a learned young theologian who held positions of responsibility in the church and the court of Charles IV. Horrified by the immorality and indulgences of the clergy, Milíč resigned from his duties to dedicate his life to the city’s poor and preach against the transgressions of the church. In 1372, his moral teachings resulted in a number of prostitutes repenting and devoting their lives to help the sick and poor. Charles IV and several burghers donated property to the cause and Milíč established a refuge, a chapel and convent dedicated to Mary Magdalen. 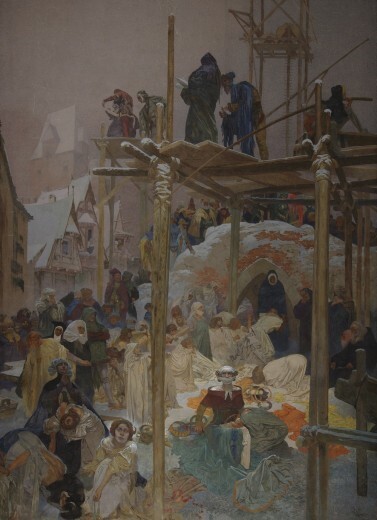 Mucha depicts the construction of the refuge for penitent prostitutes. Milíč, an unassuming figure in a blue shroud with a long grey beard, stands preaching from the top of the scaffolding. The repentant women replace their jewellery with white habits, signifying their new found purity. In the foreground, a woman in red is gagged to prevent her from gossiping.